Clark’s national level of recognition is about more than just construction. Due in part to our dedication to safety, community, and teamwork, Clark has continued to grow as a leading provider in the field. Well known throughout Michigan for more than 70 years, Clark Construction Company is a full-scale commercial construction firm with a reputation for quality. We’re family-owned, with the third generation of the Clark family carrying on our tradition of excellence. Clark Construction began as a small local contractor, serving General Motors on a number of renovation projects. We have expanded to many market segments around the country since then, and continue to be on the cutting edge of our industry. Our portfolio covers projects ranging from athletic facilities and fields, corporate office buildings, science, research and medical facilities to retail, Higher Education, K-12 and more. We are well versed in many current trends and technology, such as lean construction, sustainability, Building Information Modeling (BIM) and Integrated Project Delivery (IPD). Our employees are dedicated to the success of your construction project. Feel free to contact us today and learn what Clark Construction can do for you. Leon P. Clark founded Clark Construction Company shortly after World War II ended. Our early years were spent converting General Motors wartime production facilities back into automobile factories. Leon Clark’s strong work ethic, combined with his ideology that the customer always comes first, became the foundation upon which our company was built. Leon Clark’s sons — John and Chuck — joined the company in the 1960s and we diversified into a much wider range of construction projects, including schools, power plants, and public works. The brothers took over the helm in the early 1980s, and Clark entered new markets, including retail, food and pharmaceutical, and correctional facilities. The company thrived and we became one of the top 400 general contracting firms in the United States, adding construction management, design/build, and program management services to our expertise and portfolio. By the next decade, we were known as one of Michigan’s largest and most reputable full-service construction firms, adding higher education, resort, and entertainment projects to our portfolio. Today, our company continues to grow, adding many new markets, including sports and recreation, manufacturing, government, correctional and judicial, corporate and medical, casinos, resorts and hospitality and more. A third generation of the Clark family is now on board as Chuck Clark’s son, Sam Clark, serves as company president. 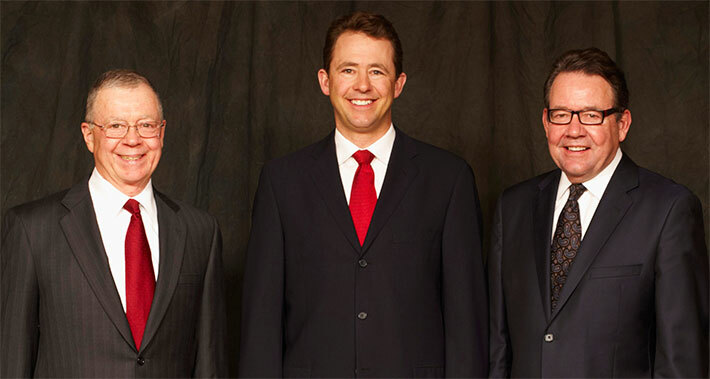 Sam Clark (center) in his first year as company president. Our projects have won state and national awards, including the prestigious Build America Award. Our business ethics are also recognized nationally. Clark was honored with the American Business Ethics Award, and we remain the only construction contractor in the nation to receive this distinction. We are committed to safety more than anything else and have the record to prove it. Clark has achieved more than sixteen years and over 4 million hours with no lost time injuries, thanks to our award-winning safety and training programs and our dedicated staff. While the construction industry has changed substantially since Leon Clark founded our company over a half century ago, we have continued to grow and thrive, constantly pushing the edge through savvy evolution and award-winning performance. We have, and always will, remain true to our founding principle — the customer always comes first.